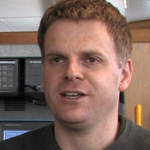 Mike has been a physical oceanographer at NIWA for the last decade. His research focuses on how ocean and ice, both sea ice and ice shelves, interact around Antarctica, and on how the ocean south of New Zealand works. He is particularly interested in how changes in ocean circulation can transport warmer water to melt Antarctica’s ice shelves, how this feeds back on sea ice formation, and in turn on the dense water formation around Antarctica that drives the deep ocean circulation. He has watched with fascination, as this issue has gone from being a side show during the 1990’s, when he was a PhD student at the Antarctic CRC and the University of Tasmania, to centre stage in the debate of how earth’s ice sheets may change in the future and how much this will raise sea level.